I haven't used up much this month compared to my past few monthly empties, but I'm getting a good start on my Project Pan mission so I'm happy with it! I have had this mask forever and I used to really love it, but the past few times I've used it it made my skin look really red, as if I was having an allergic reaction. I have plenty of other masks so I've decided to retire this! Will not be repurchasing. I loved this scrub so much for the face. My other scrubs are quite gritty, which is good for my nose and forehead area, but I wanted something more gentle to use on the rest of my face. It also smells like pineapple! I'll be repurchasing this soon, I'm already missing it. This foundation was included in my Project Pan post so I'm excited to have actually finished it! It used to be my go-to foundation but then I noticed what a bad match it was for my skin in the winter. It has a lot of coverage, I'd say medium-full, and leaves the skin looking somewhere between dewy and glowy. I will likely repurchase this in a lighter shade at some point, and I'm keeping the tube for back to MAC! Ipsy had this sample tub as an option for 250 points a few weeks ago. I've heard great things about Living Proof so I thought this was a good way to try out the brand. I got about five uses out of this sample, more than enough to see if I liked the hair mask, and I was happy with it! My hair felt softer for several days after using it. My salon just started stocking Living Proof so I will look for this mask there. I'm sure you've all tried Carmex at one point or another, so I don't need to say much about it! I like thicker, medicated lip balms at night so this tube has been a lifesaver this winter. I already repurchased. Another Ipsy sample, this is a thick moisturizer that I really liked. It smells like honey and was a good night cream. I don't know if I'd repurchase but I love the scent so much that I would consider it when I'm done with my current moisturizer! I got this in an Influenster box several months ago and was very curious to try it. The wand is very strange, with a big ball tip and four arching bands covered in rubber bristles. Sadly I did not like it. If it didn't have the ball tip I would have used it more often, but the ball was a magnet for excess product and it seemed like no matter how much I scraped off all of that product would go on my lashes or around my eyes. Even just using it on the bottom lashes was difficult! I wouldn't purchase this for myself, but I would like to try the Covergirl Supersizer mascara that I've been hearing a lot about. And that's it for my empties this month! What have you finished recently? 21 comments on "February Empties"
I really need to try some stuff from Living Proof, I have heard lots of good things about them. The Alba Botanica scrub sounds amazing, I haven't purchased a scrub in a long time since I always do a recipe using honey and sugar but I would love to try this one, love the pineapple scent. I threw away that CoverGirl mascara after trying it 4-5 times, it did nothing for my lashes. No volume, no curl, no length, I might as well don't wear mascara. And you need to try Living Proof Prime Style Extender, I freaking love it! Good on you for finishing up a foundation! It takes me forever to go through a bottle myself. I love the MAC studio sculpt foundation too ! Great one. You finished a bunch of products this month, wow! I like the sound of the MAC foundation. I really want to try more face products from them, so I'll be checking that one out! I hate myself for not buying the living proof restore mask when I had the chance. 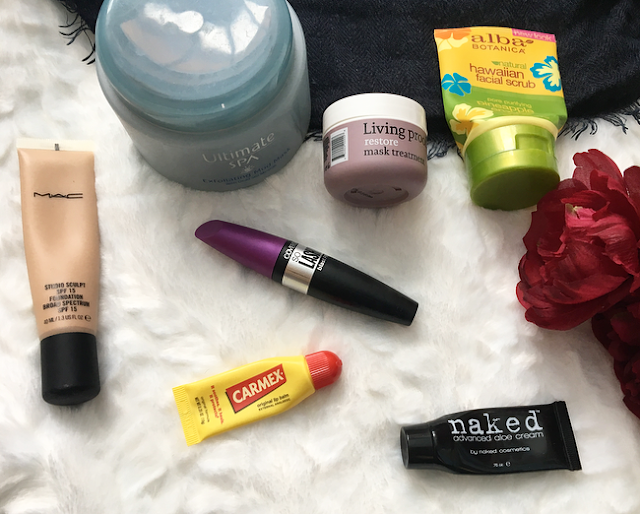 I love Carmex, it's one of my favourite lip balms! So good to finish up a foundation! Love carmex! The Mac foundation is definitely one I would like to try out. Such a great post, my love! I need to try that MAC foundation, ASAP! I'm doing a project pan too! Once trick I use for Back to MAC is sometimes I decant my foundations into other containers before they're empty, so that I can return the tubes and trade them in! It must feel so awesome when you finish a product. I know I love that feeling. Everyone seems to love the Carmex but I have yet to try it. I should check it out real soon.